There may come a time in your life where you want to or need to create a side hustle to earn extra income. A side hustle can be many things depending on your skills and the depth of your need. Regardless what you choose it will be something you do on the side (apart from your day job) to bring in additional money to the family budget. Side hustles can be a financial blessing. They can help you build up your savings account or pay off debt or meet any a number of financial goals you might have. A few bloggers I know have turned their writing side hustles into full-time jobs and now run their own personal finance websites. Others, like my friend Cat Alford at Budget Blonde have figured out how to make a full-time income from writing for popular blogs. Now she is teaching others to do the same in a brand new course she has developed – Get Paid to Write for Blogs. While the additional income of a side hustle is welcome there is a dark side that many are unprepared for. Side hustles done improperly can be a curse on family life. It’s one thing to have a side hustle if you are single. I remember talking with a blogging friend last year who told me how he’d work his 9 to 5, take a 30-minute dinner (maybe) and then work till past midnight writing and networking. I’m not saying that’s necessarily an easy schedule but it’s not like you have anyone else to account for. It’s just you. When a spouse and/or kids are in the picture side hustles take on a whole different dimension. The first thing you’ll notice is the tension that surfaces the minute one member begins a side hustle. What was a normal life is no longer normal. Dinners are fragmented or rushed. Kid’s T-ball games are missed. Communication wanes and intimacy is skipped. You know the side hustle must be done to improve your financial life. But you also know family life matters. How can you manage it all and not go insane? Here are a few strategies I used from my early days of blogging before I became a stay at home dad. This is all about changing your mindset and preparing the family for what lies ahead. Things are going to be different now that one of the adults is engaged in an additional moneymaking activity. It’s best everyone in the family knows what to expect. So you’ll have to cast the vision of why the side hustle is important. Talk about the financial need, your dreams and what this could mean for the family down the road. Develop a list of financial goals you’d like to reach. Check those off one by one as you reach them. This will build excitement and momentum. It will also keep the family motivated to keep the side hustle going as long as needed. Make sure the other members of the family know when you will be busy and when you will be available. If working from home, set some standards for the home environment that will be conducive to getting work done. As tough as it may be (especially on kids) everyone needs to minimize interruptions so the one pursuing the side hustle can work efficiently. Finally, agree on how the other members of the family are going to step up and share the burden of running the household. The one running the side hustle will have less time to devote to household responsibilities. Others will have to agree to fill the gap for the side hustle to work. By far the greatest barrier to a side hustle is time. “I don’t have enough time” is already the #1 excuse we use for not getting stuff done. Add a side hustle to the schedule and any free time will be eaten up. This became readily apparent when I first started blogging. I’d come home from work and spend the evening writing. It worked for a week or so until I realized other tasks I’d done before during that time were falling by the wayside. The grass wasn’t getting cut, the house wasn’t clean and I hadn’t played with the kids. How could I fit it all in? The answer is you can’t…unless you make some adjustments. First I chose to free up some time. I cut back on almost all TV watching, video/computer game playing and social media perusing. I also started saying “No” to some outside-the-home activities with friends and cutting back on my responsibilities at work. I simply couldn’t do it all and something had to give. Next I chose to create new time. How did I do that since one cannot simply add hours to the day? What I mean by create new time is to find time that you weren’t using before and incorporate it into your new daily schedule. For me that meant getting up earlier to write before work – sometimes as early as four in the morning. I could write for two solid hours before getting ready for work. That took the pressure off of writing in the evening hours and allowed me to focus more on the family’s needs. Finding additional time wasn’t easy and it did cut back on my sleep. That is going to make the next issue really important. No one can go 24-7 even though we like to tell ourselves so. Our bodies need time for rest and relaxation. So not all the hours of the day should be devoted to your main job and your side hustle. Taking breaks is important but it’s not enough. The increased workload means less time for relaxation and sleep. You’ll likely be more tired than you’ve ever been before. That’s why it’s vital that some of the new time you create must be for exercise. The benefits of exercise have been well documented. I could see it in my own life when I was training for my marathons. Even though I was running 5-10+ miles, 3-4 times a week, I had energy to keep me going from 4 am to 10 pm (or later some nights). Running produced energy for my body. 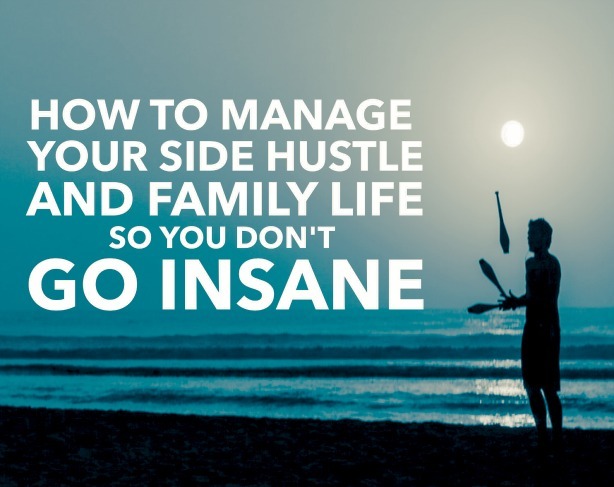 You’ll need the same energy to maintain the side hustle and interact with your family. As soon as you start the side hustle your whole world will become a jumbled mess. What once was manageable now seems chaotic. It feels like you need to hire a personal assistant just to help you keep track of all that is going on. You don’t need a personal assistant but you do need to get organized. Even if you are an organized person you need to get more organized. I live a pretty efficient lifestyle and I was constantly letting things slip by. For starters I developed a schedule for my writing and decided on the days I wanted to post an article to my blog. That helped me map out when I would be writing and plan my work schedule ahead of time. Secondly, we streamlined all of our various calendars into one by using Google Calendar. All our work, personal and school activities were blended onto one place. Because it is an Internet based calendar we could access it anytime, anywhere and see what events were planned. This kept me from double-booking my writing time with a kid ballgame or other activity. You’ll have to do something similar with whatever side hustle you pursue. Life will get hectic and it will be easy to lose track of important family events. Develop a system that’s easy for all the family to use so you stay connected to what’s going on. My final suggestion to balancing family life with your side hustle seems like an easy one. In reality, it will be harder than you think. Here’s why. It’s exciting to start making money! When you see how this extra money from your side hustle impacts your family and helps you reach those goals you laid out in the first step, your tendency will be to keep going at it…and at it…and at it. And sometimes you can go at it so far that you neglect the family. I remember one time about a year into writing I was working on a post when my then 10 yr-old son comes walking into the living room with his football. Tossing the football in the air he casually says, “Dad, you busy?” Nothing subtle about that question is there? I got it. And in that moment I knew what needed to be done. I closed the laptop and went outside to throw the football. Side hustles are required sometimes. Our financial lives don’t always go as planned. Whatever you choose to take on give it your best effort and reach those goals you’ve laid out for yourself. But never take on a side hustle at the expense of the immediate family. Nothing is worth losing connection with the ones you love. You’ll never regret defaulting to family where your time is concerned. If you are looking into earning some extra money with a side hustle, you are in luck. There are many things you can do. I’ve chosen writing because a) it’s a skill I possess, b) it fits my schedule and c) it’s scalable if I want it to be. But there are so many other things that can be done in the online or offline world. You simply have to find something that sparks your interest and that you can manage with your family schedule. The possibilities are only limited to your imagination. Best of luck finding a side hustle that works for you. It can take you to a whole new level of financial stability. Just don’t let it take your family. Questions: What experience do you have with doing a side hustle to earn extra money? How do you manage your side hustle and all your other commitments? What piece of advice would you give to someone thinking about starting a side hustle? Thank you so much for your support of my course! I’ve said it a few times to others but I think one of the reasons I was able to get my business off the ground was because my husband was in medical school. He studied every night until midnight and I sat right next to him and wrote until midnight. In fact, we are still doing this now. If he had a 9-5 job and expected me to have dinner on the table and spend time with him, I wouldn’t have been able to build a business on the side. Our family life is a little crazy but it’s spent together. I’m glad that I was able to quit my job so now I have a bit more balance. Great advice all around! This is such a good topic Brian! Even if I’m always busy, I make sure that I have enough time for my one and only daughter. I always see to it that everything is balanced with my work, side hustle and especially with my family. This is really, truly great advice. I am moving toward freelancing after our upcoming move. I don’t want to work full-time and I won’t have to after our house sells, so the plan is to freelance my tail off until the house sales. Anyway, I know I will be tempted to keep doing it after the house sells, but it comes at a sacrifice to the family time I am craving. So, I have been sitting down, listing out the goals I have for myself, both financial and life goals. That way I can say, hey, this opportunity doesn’t mesh with both sets of goals, so I’m going to pass on it. I have so much respect for those who manage a full-time job with a family. I’m constantly asking my co-workers how they find the time for things like exercise! Adding a side hustle into the mix definitely adds an additional layer of difficulty. You’ve made some great suggestions, though! Kate recently posted…How Much Side Hustle is Too Much? With my blog I found it best to carve out time early in the AM before everyone else in the family was awake to get my work in. This way it didn’t interfere with anything else. It meant getting up a bit earlier each day, but has worked out well.